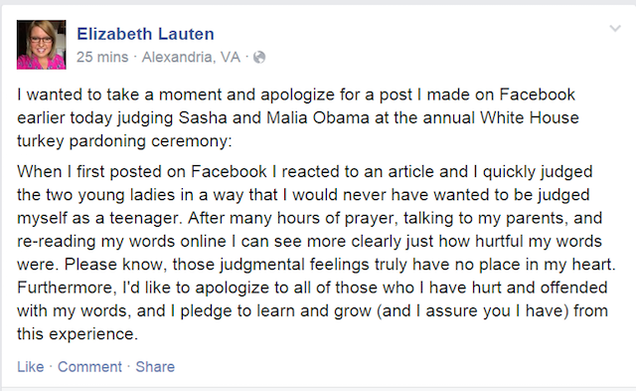 A Republican staffer on Friday apologized for a Facebook post that criticized Malia and Sasha Obama's appearance at the annual White House turkey pardon ceremony, one of America's silliest holiday traditions. "I reacted to an article and quickly judged the two young ladies in a way that I would never have wanted to be judged myself as a teenager," she said. "After many hours of prayer, talking to my parents and re-reading my words online, I can see more clearly how hurtful my words were. Please know that these judgmental feelings truly have no place in my heart. Furthermore, I'd like to apologize to all of those who I have hurt and offended with my words, and pledge to learn and grow (and I assure you I have) from this experience."